No matter how long we have been a disciple of Jesus it is important to periodically revisit the basics. It is easy for even the most committed believer to drift into a variety of unhealthy spiritual habits. We all need to take the time to reflect on where we are and why we are doing the things we do. This book serves that purpose well – a refresher course of sorts. In fact, this book would be a very useful orientation guide for new believers as well. You won’t find anything off-the-wall, nor – on the other hand – will you find the author pulling his punches on what it really means to walk the way of Jesus. You will encounter some old, but seldom taught ‘ways’ of Jesus. Many notions will be familiar, yet expressed and illustrated in fresh and simple terms. Probably most rewarding are the ‘between the lines’ insights into the life of Jesus. 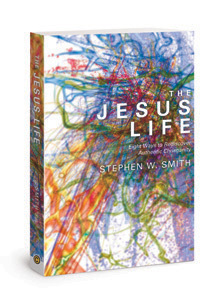 Smith explores the many ways of Jesus that can’t be read as commands in scripture, but have been gleaned from meditating on the whole of His life. We often prefer a list of things to believe rather than a life to live, but that’s not what this book is all about. I have been a fan of the New Testament Voice for several years. This updated edition deepens my appreciation for the Voice. One of the first things you will notice is its conversational format. This restructuring of the text underscores what is implicit, but often neutralized by common presentation. Structure and function should work together for efficient communication. The next valuable feature is the translation itself. It reads clearly for the 21st century reader, yet remains accurate to the best texts. Thirdly, the translators have made an effort to create wonder. Wonder, it has been said, is the playground of the Spirit. Shouldn’t the reading of scripture always be an experience with the living God? An example of this is how references to Jesus omit the traditional transliteration, ‘Christ’, for the unexpected translation, ‘ the Anointed One’. One final point, I am reviewing the digital version of the Voice. I love it! It is easy to navigate, unlike many digital bible versions. It was an easy download on to my iPad. You will find a useful daily reading guide and embedded notes along the way. Few Christian authors have captured the new covenant of grace as completely or expressed it so elegantly as has Andrew Farley. Without any apologies, Farley has presented what many prophets of old longed for. In Christ the ultimate beauty of God is made known. For those who are willing to see, the love of God removes all fear. In the place of fear is the peace that nothing can remove. Farley’s book is easy to read. The chapters are short and immediately digestible. Consistent with all that we should expect from God, what is presented doesn’t require a theological degree to gasp. It is straight forward and to the point. He begins by differentiating between the old and the new covenant, explains the role of the law, makes clear the purpose of Christ, and ends by describing the effects of faith in the life of a believer. The is a reason why so many are confused in their Christian faith. Far too many present a skewed gospel that leaves believers with one foot in the old covenant and the other in the new – effectively making of no effect either one of them. Farley brings us back to the simplicity and transformative power of God’s grace. The ball, as they say, is now in your court. Let’s cut to the chase. Jim Palmer is in trouble. Trouble beyond divorce, two near death accidents, bankruptcy, and being rejected by his publisher. Palmer is in trouble just being Palmer, er…’being Jesus’. Jim speaks openly and honestly about his life. In this book he invites us into the web of his life – into both the joys and the agonies. The stories are captivating. His pain palpable. What he learns through each incident is aggravatingly provocative. Some will resonate. Others will, of course, conclude that Jim has totally slipped off the proverbial slippery slope – the one he’s been flirting with for many years. Yet, Jim Palmer just keeps on moving ahead, evolving. Would you have developed similar insights having endured the same trials and tribulations? Can you, at least, understand why he sees life as he currently does? Could you have survived as many losses? Actually, none of those questions capture the point of his book. For me, the salient truth is in the question, ‘would I be willing to pursue truth wherever it led me, regardless of the results?’ Where might Jesus lead me if I truly took the time to directly ask Him? That would be ‘the way of Palmer’. ‘Being Jesus means…’ is the launching pad for each chapter. This is a measurably different approach from asking, ‘what would Jesus do?’ and settling for the usual institutional Christian answers. Jim, wisely, decided to ask Jesus, God, Himself. ‘What does it mean to be You, right now…’ Isn’t that pretty much how Jesus lived each moment? Didn’t he claim that he didn’t say or do anything except as the Father gave him direction? Wouldn’t we, in one sense, ‘be’ Jesus if we invited Him to speak and act through us? Huh? Not so novel, right? Yet, so decidedly not orthodox.